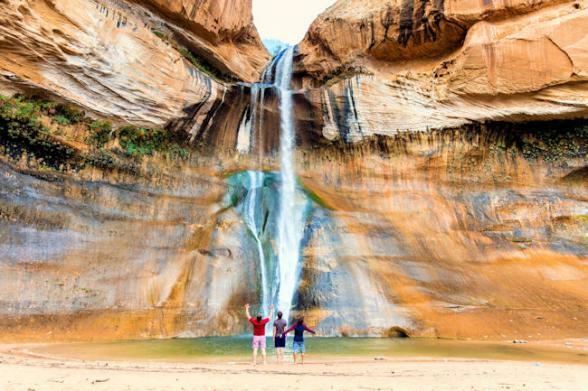 A contrasting journey of discovery from the mighty, majestic mountains of lush Colorado to the red sandstone canyons and incredible National Parks of stunning Utah. 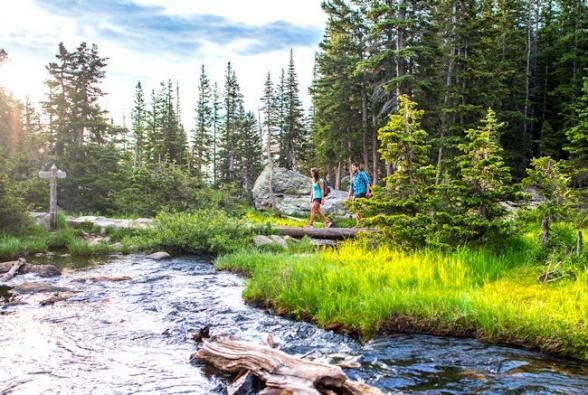 Arrive in Denver for the start of your journey of contrasts from the verdant mountains and meadows of Colorado to the dramatic red rocks of Utah. Boasting over 300 days of sunshine a year, Denver is set at the base of the Rocky Mountains and is located a mile above sea level. Head to historic Larimer Square for casual dining and cocktails to officially start your holiday, or take a walking tour of the city and visit its attractions such as the State Capital, US Mint, Coors Baseball Field and the excellent Denver Art Museum. For a taste of the Wild West, head to the Buckhorn Exchange. This saloon, opened in 1893, was Buffalo Bill’s favourite watering hole in Denver and today serves buffalo, elk, quail and even rattlesnake. Be sure to order his favourite tipple, apple juice and whiskey! 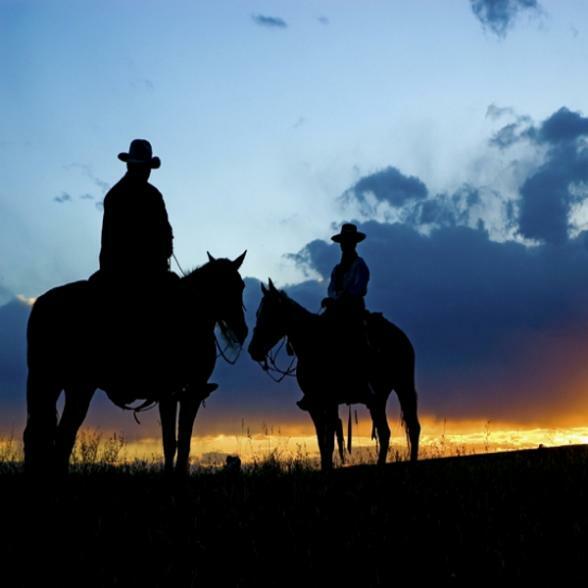 Make the most of today's journey by starting early and heading west out of Denver and along HWY 24 to Leadville. This is the highest incorporated city in the US, with magnificent views across ice-laden Mount Elbert and Mount Massive, Colorado's two highest peaks at over 14,000 feet! Stroll Leadville’s National Landmark District, which includes 70 square blocks lined with Victorian-era buildings, most of which were built between 1880 and 1905. Or pop into the Healey House Museum to learn about how people lived during the silver mining boom. 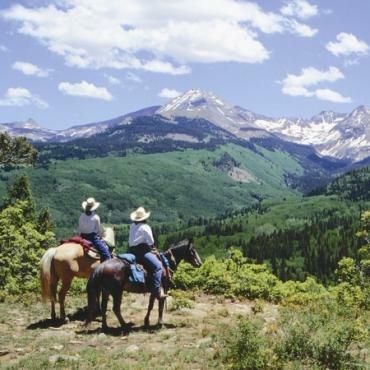 Take the rest of the day to drive slowly through the mountains and enjoy the splendid scenery before you arrive in sleepy Gunnison for your overnight stop. Plan to arrive at the Black Canyon of Gunnison early morning, to make the most this eerie canyon. Deep enough to fit the Empire State Building, the walls are composed of volcanic schist predominantly black in colour, as the gorge reaches depths of over 2000 feet with only 1500 feet across, sunlight rarely illuminates the walls, hence the name Black Canyon. 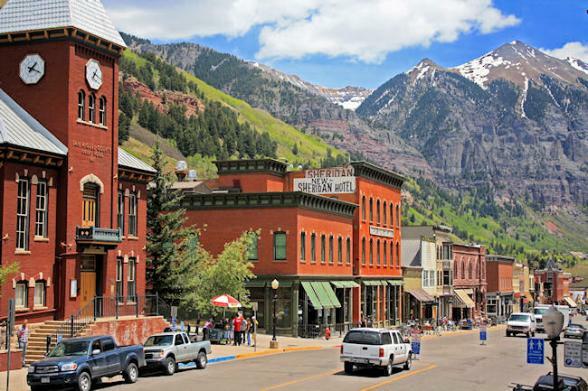 Onwards to your next stop the picturesque town of Telluride, nestled in a region justifiably referred to as the Switzerland of America and surrounded by the San Juan Mountains. The town is listed as a National Historic Landmark, and is where legendary Butch Cassidy robbed his first bank on 24th June 1889. Today, it's a delight to explore! If you're feeling energetic, take a hike up Bridal Veil Falls. 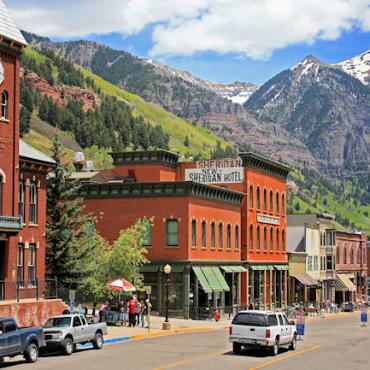 In nearby Ouray, take a relaxing dip in the famous sulphur-free hot springs. 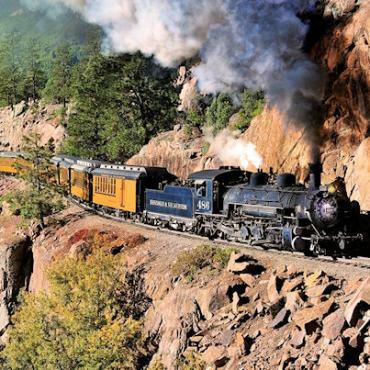 The winding US550 known as the scenic Million Dollar Highway will ease you into Durango, once a rail junction for the Gold Rush community and now a bustling Western cowboy town. 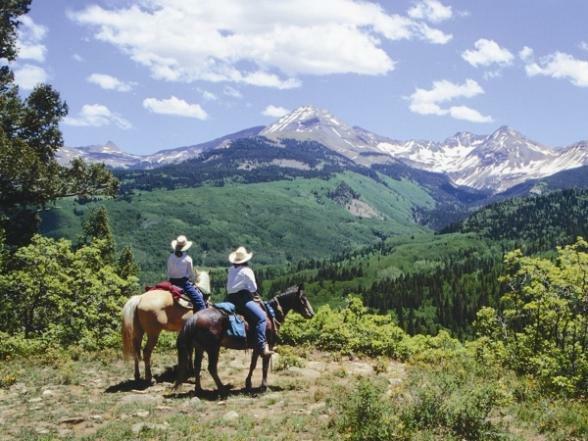 Durango is a great base for white water rafting and mountain biking, and most importantly, is the departure point for the famous Durango and Silverton Narrow Gauge Railroad. 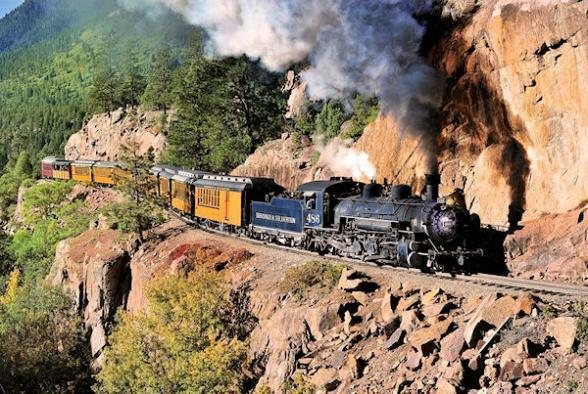 This vintage steam train follows the Animas River into the Colorado wilderness along 45 miles of rails originally laid in 1892. 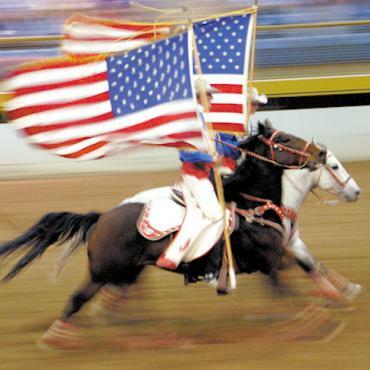 This a must-do excursion on any holiday to Colorado, and can be pre-booked in advance as part of your holiday. In the evening step back in time at the Diamond Belle Saloon, revered as one of the most famous original ragtime piano bars in the Wild West. 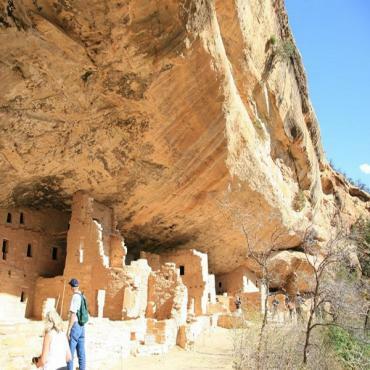 Mesa Verde, known for its well-preserved Ancestral Puebloan cliff dwellings, is the only American National Park that protects man-made structures, as opposed to natural features. In hilly, inaccessible country south of Cortez, this UNESCO World Heritage Site is home to over 4,000 separate historic ruins. As you cross the border into Utah the scenery starts to change. 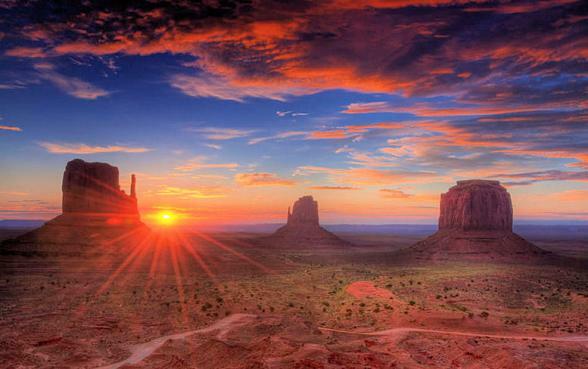 The lush landscape of Colorado is replaced by the dramatic red rocks and desert scenery of Utah. 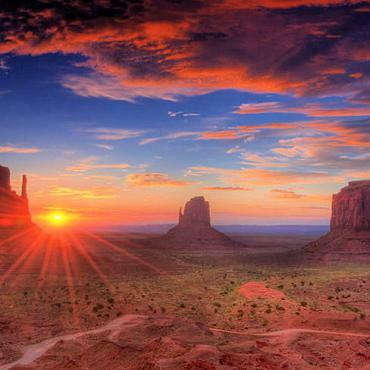 Monument Valley...Perhaps the most filmed and photographed landscape in America, this valley of monoliths and buttes has been a favourite Hollywood backdrop for years. 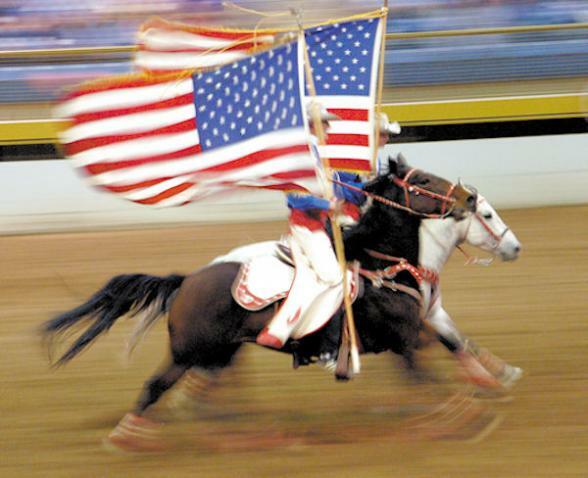 Still a traditional Navajo homeland, Bon Voyage can arrange guided horseback or jeep tours through this legendary tribal park. Moab is a charming western town and a great base from which to explore Arches and Canyonlands National Parks. Arches National Park features the worlds greatest concentration of natural stone arches, be sure to view Delicate Arch and Balanced Rock. 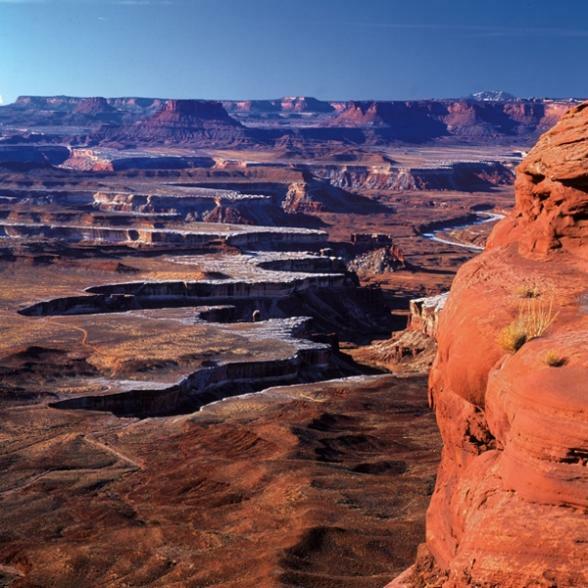 Whereas Canyonlands, set at 6,000ft, is an island in the sky, a high broad mesa with three spectacular major view points. Both are wildernesses of rock and simply stunning. En route to Aspen, Colorado, stop a while at Grand Junction -known as a palaeontologist’s playground and home to the greatest prehistoric bones ever recovered. 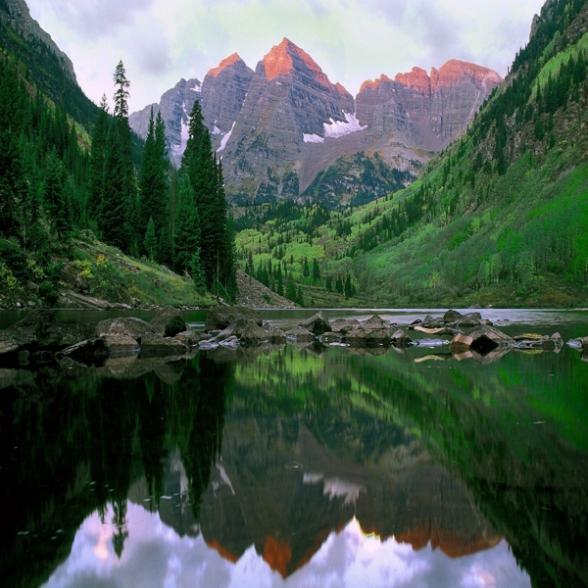 Nestled in the heart of the White River National Forest and surrounded by the Elk Mountains, the pristine town of Aspen will delight you. This famous ski town offers outdoor recreation year-round and is a haven for fine restaurants and resorts. If time allows, visit Maroon Bells, 11 miles from Aspen, and touted as the most photographed place in Colorado, pictures simply don’t do the peaks justice. Here, two giant snow-striped mountaintops loom over a lake, reflecting their changing colours throughout the seasons. 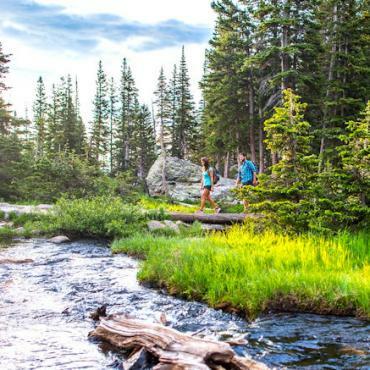 A tenth the size of Yellowstone National Park, Rocky Mountain National Park is undeniably beautiful. Straddling the Continental Divide with elevations in excess of 10,000 feet. A third of the park is above the tree line and large areas of snow never melt. Large arctic-style areas of tundra mix with mountain meadows, rich forests and glacial lakes. It's the perfect end to your journey of contrasts. The last day of this contrasting tour of Colorado and Utah before heading back to the UK. However, your adventure doesn't have to end here. Why not extend your stay and explore Denver for a few days or perhaps you may want to head to the bright lights of Las Vegas? 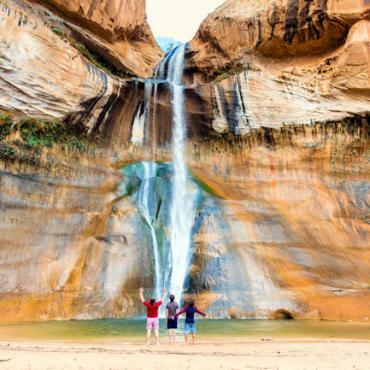 Call the travel experts at Bon Voyage to discuss your dream Colorado and Utah adventure.